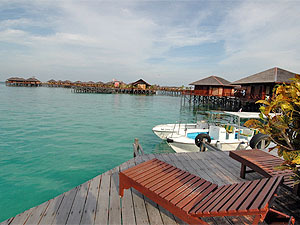 Resort and Diving Rates :: Sipadan Water Village Resort, Mabul Island, Borneo. Airport meeting services in Tawau. Return land transfer from Tawau to Semporna / Semporna to Tawau. Return speedboat transfer from Semporna to Sipadan Water Village / Sipadan Water Village to Semporna. For single occupancy, a supplement fee of 50% on top of the published price applies. Children 12 to 03 years are charged 50% of the applicable non-diver's rate and infant 02 years and below are charged 10% of the applicable non-diver's rate provided they do not occupy separate rooms. Age is taken as at the commencement of journey. 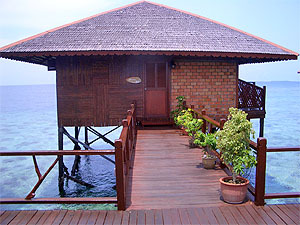 The package includes 3 boat dives daily plus unlimited diving on the House Reef. 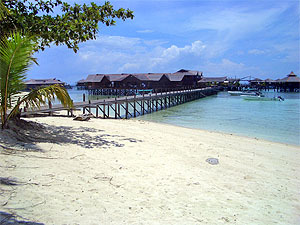 Boat dives may be at Mabul, Kapalai or Sipadan. Weight, weight belt and tanks are included. 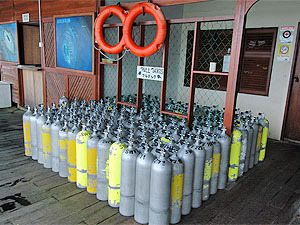 Unused portion of the dives are not refundable and not transferable.